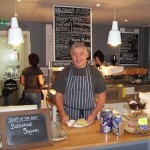 Alan has worked within the catering industry for nearly 40 years (information he is less likely to divulge!) He started his working life as a Pastry Chef at Royal Mail House, Leeds and throughout his service he worked at Braford, Wakefield and Harrogate in varying roles both in cooking and management. During that period he was a member of the National Craft Forum developing new menus and recipes. After 26 years at Royal Mail, Alan moved on to become Chef Manager at St Gemma’s Hospice, Leeds, a job which he found most rewarding and challenging in many ways. When the opportunity arose to buy North Street Deli, Wetherby he and his wife Diane, took it with little hesitation! Alan has been married to Diane, also his business partner, for 7 years. He has a son and daughter from his first marriage and 2 grandchildren. Q: What do you always carry with you? A: Photo of Diane and my Match & More card! Q: What do you normally have for breakfast? Q: Cast away on a desert island what luxury item would you like to take with you? Q: What ingredients do you hate most? A: Celery – devil food! Q: What ingredients do you like most? Q: What is your favourite meal? Q: How do you relax? Q: If you were not in catering, what would you do? Diane started her working life as a cook at Royal Mail where she worked for many years with several job changes. Her last role before leaving was Front of House Supervisor after which, she changed career completely! She became a Student Advisor, firstly at Park Lane College, now known as Leeds City College, then at Leeds College of Art where she worked giving pastoral support to students of all ages for 10 years. 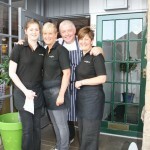 Whilst it was a rewarding job, the time came to join forces with Alan in order to move North Street Deli forward. Diane has 1 son and 2 daughters from previous marriages and 2 grandchildren with one more imminent! A: Holiday Tour guide for the ‘more mature traveller’!